Sen. Chris Bray (D-Addison), left, takes a question from Sen. Jane Kitchel (D-Caledonia) on the Senate floor Thursday. When the final tally was taken Thursday on a bill designed to improve the siting of renewable energy projects in the Senate, it passed 22-3. Sounds like a slam-dunk piece of legislation with wide support, right? This bill was anything but that. Senators spent four and a half hours wading through some 30 amendments before ending up with a patchwork bill that almost no one likes. The overall bill is intended to give local communities more say in where wind and solar projects are sited. More than 100 Vermont towns have signed a petition arguing that the state Public Service Board approves projects without regard to local sentiment. But some of those critics argued the bill still leaned too heavily in favor of energy developers. Sen. Chris Bray (D-Addison), chair of the Senate Natural Resources and Energy Committee, started Wednesday thinking he had reached what he called “a grand bargain” of compromise amendments that he and Senate President Pro Tempore John Campbell (D-Windsor) hoped would win over those critics. One piece of Bray’s compromise called on the state to monitor sound levels at wind projects, including those already built, at the developers’ expense. Neighbors of three large wind projects — in Lowell, Sheffield and Georgia — have argued that complaints about wind turbine noise have gone unheeded for several years. Melodie McLane, who lives next to the four-turbine Georgia Mountain wind project, attended Thursday’s vote, trying to persuade senators that having unbiased, continuous sound monitoring is the only way she’ll be able to prove the turbines exceed sound limits. Her hopes quickly dimmed as Bray withdrew his support for the monitoring. 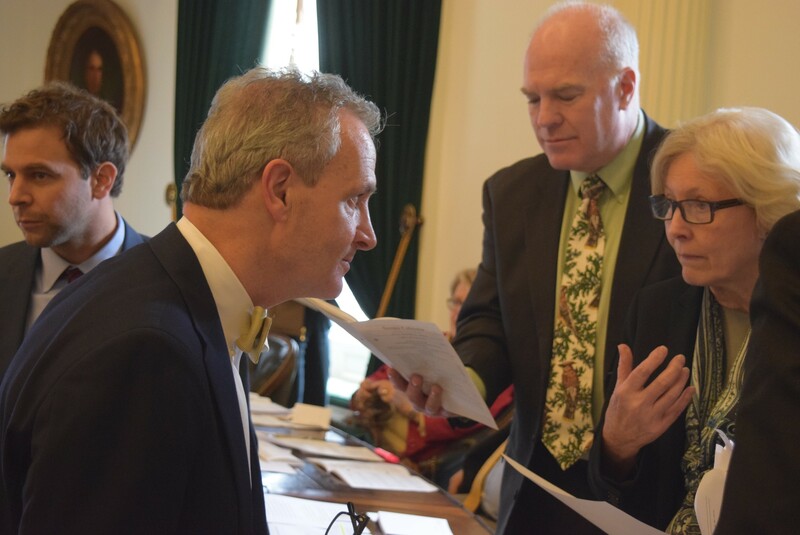 Green Mountain Power is spending $264,000 a year to monitor sound at the 21-turbine Lowell project it owns following a noise violation there, Todd Bailey, a lobbyist for the company, told lawmakers. To retroactively require all wind developers to pay for that kind of monitoring is unnecessary and unfair, renewable energy advocates argued. They got their message to Bray and other senators in a hurry. The Senate voted 18-8 to strike sound monitoring from the bill. What started out as an agreement to appease wind energy critics appears to have left them more peeved. Sen. John Rodgers (D-Essex/Orleans), who has sought a moratorium on wind projects, was so miffed at the turn of events that he stormed out of a morning meeting where Bray’s committee was discussing amendments. The Senate did go along with other amendments that were part of Bray’s late compromise, including directing the Public Service Board to settle a pending case involving wind noise complaints in Sheffield. It’s unusual for lawmakers to insert themselves into a specific ongoing case. Several senators suggested that irritation with the Public Service Board had reached a boiling point. “What we’re really angry about is the board and its performance,” said Sen. Ann Cummings (D-Washington). Even as senators approved the bill, they grumbled about the confusing amendment process and the lack of vetting for some of its contents. “I don’t have a clue what anyone’s talking about,” Sen. Peg Flory (R-Rutland) said less than halfway through the late-afternoon debate, expressing a sentiment others clearly shared. Lobbyists milling outside the Senate chamber quietly indicated that they would look for the House, where the bill goes next, to make alterations.